You are here: Home / Decisions / Are You Faithful in The Little Things? Often times we find ourselves committed to causes that we really believe in. We make sure that we do all that we are asked to do. If we have committed to doing something or being somewhere, we’ll make sure that we are faithful to show up or do it. That’s great! We are showing that we are disciplined. Are you as committed to yourself or even to your relationship with God as you are to these other commitments? How many times do we make ourselves promises only to break them? Where do we lack commitment to self? Is it in working out? Is it in reading, praying, or having time to rest? Maybe you told yourself a long time ago that you wanted to do something, like finish your degree or go back to school, but you never did it. Did you fine that you we committed to other things? There is nothing wrong with having priorities and realizing that what you wanted to do for yourself, just didn’t fit into the picture at that time, but what about now? Have you lost sight of a dream or desire and left it on the back burner? Perhaps you’re like me and said that you wanted to read the Bible all the way through and never did it…well, what are we waiting for? There will never be a better time than now to commit to doing something for ourselves. Really?! Are you still waiting on yourself to fulfill the commitment that you made to yourself years ago? Be good to yourself so that you aren’t angry when God calls you to be good to someone else. Be faithful in the small things for you. People always call us to be faithful in the little things others, but you count too. 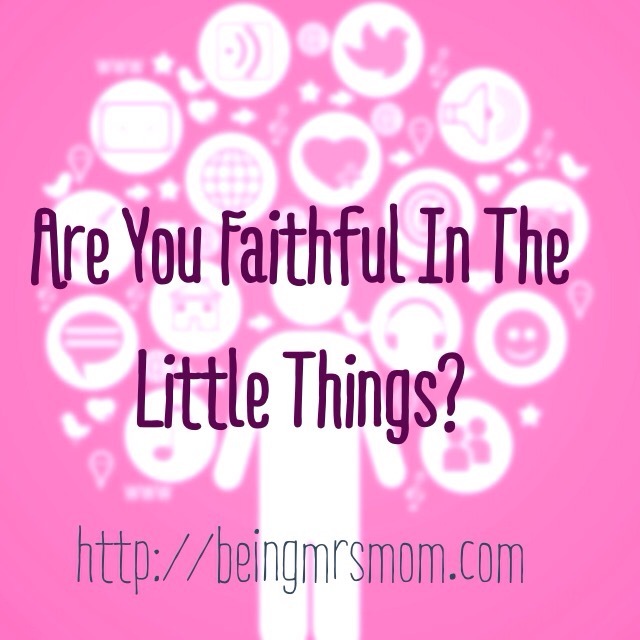 Be faithful in the little things in your life…the little things that are important to you. Perhaps you should take a rest today. Maybe tomorrow, you can paint your nails. Over the weekend you can go for a run or walk. Read that book you’ve been wanting to read. I’m sure you can find an hour in your day to do this. Talk to God while you ride in the car. I’m sure that if you find time to do this, you will feel great about you. Remember, you are loved and you matter! What a fantastic read as I am getting my day started! Thank for this reminder! I’m so glad you found it helpful. Thanks for commenting. Yes! Let’s be faithful today! Thank for commenting. I’m glad that you enjoyed reading this post. This is a great reminder for me…thanks! Amen! We always want to focus on the big,overwhelming things, but never think about all the chances we have everyday to tend to the small things in our lives. whether big or small, if God can get His glory of it, that’s all that matters! Thanks for stopping by to comment and share your thoughts with us on this. It’s so easy as a momma to put off my own needs — but that always leads to being depleted. Thanks for this reminder to be faithful in the small things, even to myself. I have to always remember that when I am good to myself, I am good for my family. Thanks for commenting. I’m glad you found this helpful.